In Radical Cities, Justin McGuirk travels across Latin America in search of the activist architects, maverick politicians and alternative communities already answering these questions. From Brazil to Venezuela, and from Mexico to Argentina, McGuirk discovers the people and ideas shaping the way cities are evolving. Ever since the mid twentieth century, when the dream of modernist utopia went to Latin America to die, the continent has been a testing ground for exciting new conceptions of the city. An architect in Chile has designed a form of social housing where only half of the house is built, allowing the owners to adapt the rest; Medellín, formerly the world’s murder capital, has been transformed with innovative public architecture; squatters in Caracas have taken over the forty-five-story Torre David skyscraper; and Rio is on a mission to incorporate its favelas into the rest of the city. Here, in the most urbanised continent on the planet, extreme cities have bred extreme conditions, from vast housing estates to sprawling slums. But after decades of social and political failure, a new generation has revitalised architecture and urban design in order to address persistent poverty and inequality. Together, these activists, pragmatists and social idealists are performing bold experiments that the rest of the world may learn from. 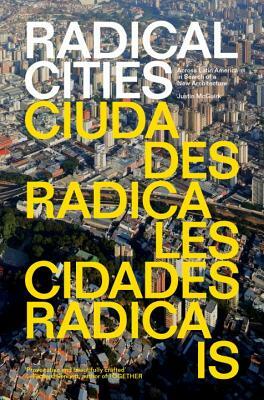 Radical Cities is a colorful journey through Latin America—a crucible of architectural and urban innovation. Justin McGuirk is a writer and curator, and has worked as the Guardian's design columnist and the editor of Icon magazine. He is also the director of Strelka Press and the design consultant to Domus, and his writing has appeared in the Observer, the Times, Disegno, Art Review, Condé Nast Traveller, Form, the Architects Journal, Architecture d'Aujourd'hui. In 2012 he was awarded the Golden Lion at the Venice Biennale of Architecture for an exhibition he curated with Urban Think Tank. He is the incoming Chief Curator of the Design Museum in London.